The original prototype (flown in May 1932) was a Ju 52 redesigned to be powered by three engines. Most early civil examples had the 447kW BMW Hornet engine, made under Pratt & Whitney licence; but the vast bulk of later sub-types had the derived engine known as the BMW 132, rated at 507-618kW. Like the original single-engined Ju 52, the tri-motor transport had a structure wholly of light alloy with corrugated skin and a very large cantilever wing-with patented 'double wing' flaps and ailerons giving great lift at low airspeeds. The fixed landing gear was almost unbreakable and on a few examples had spats; float-seaplane and ski versions were not uncommon. The Ju 52/3m was by far the leading European civil airliner of the 1930s, seating 15 to 17 in single seats each side of the central aisle. It carried more than 75% of Luft-Hansa's Europe-wide traffic in the 1930s, the airline using at least 120. Exported civil models had Wasp, Hornet and Pegasus engines, and a small number in Germany had Jumo diesels. Thirty airlines in 25 countries made it their standard medium-range airliner - and it equipped the new Luftwaffe’s transport squadrons. Yet the Luftwaffe also adopted the Ju-52 as an auxiliary bomber (Behelfskampfflugzeug) in October 1933, and because of problems in the development of the Do 11 bomber, the Ju52 equipped many of the Luftwaffe's bombing units as well as its transport squadrons in the mid-1930s. Within a week of the Spanish Civil War’s start, 20 such aircraft were placed at the Nationalists’ disposal, being employed initially to ferry men and supplies from Morocco to mainland Spain. Nine aircraft were then diverted to form a bomber unit. From November 1936 the Legion Condor arrived in Spain, and its Kampfgruppe 88 bomber component had three Staffein each fielding 12 improved Ju 52/3m g4e aircraft. From February 1937 KG/88 received more modern bombers, and 55 Ju 52/3m g4e aircraft were passed to the Spanish, who used them as bombers up to the end of the war, when 23 remained on strength with 1- and 2-0-22. The Ju 52/3m first entered service with the Luftwaffe as the Ju 52/3m g3e bomber transport, a hybrid type providing the fledgling German bomber arm with a limited offensive capability and, more importantly, operating experience with modern multi-engined monoplanes. In 1935 the first 3mg3e bombers reached the Luftwaffe, with 1,500kg of bombs and MG 15 machine-guns in a dorsal cockpit and ventral 'dustbin'. In 1936 about half the total production (450) of this model were serving as transports or bombers with the Condor Legion in Spain. Total production of all models was about 4,845 on German account, 575 of which were completed before 1940. German plants then made a further 2,659, the rest comprising output by Amiot for the Luftwaffe. 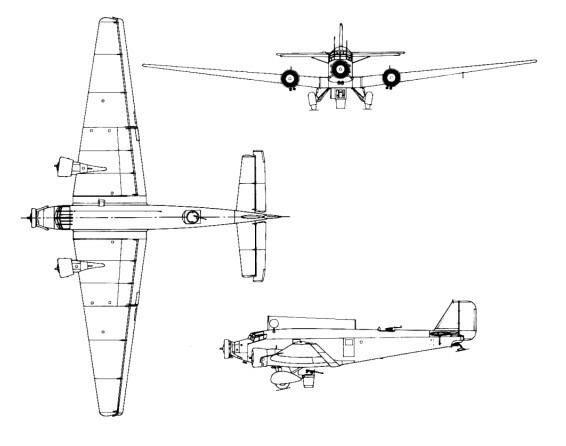 The latter was continued post-war by the AAC which delivered 400 by 1947 with the designation AAC.1. A further 170 were built by CASA in Spain as the C-352. More than 3,500 served with the Luftwaffe, nearly all in the transport role with the popular names 'Tante Ju' (Auntie Ju) and 'Iron Annie'. The most-produced wartime types were the 3mg5e, 7e, 8e and 14e, though differences were confined to such features as armament, loading arrangements, autopilot, glider couplings and crew armour. There were several non-transport versions, such as the g6eMS with a degaussing ring for exploding mines. After 1945 BEA used a fleet on internal services and the Spanish T.2B version was not withdrawn until 1975. One of the last, with the Swiss Air Force, was still active in 1979. Engines: 3 x BMW 132A-3, 541 kW (725 hp). Max T/O weight: 10500 kg (23,146 lb). Max speed: 165 mph at sea level. Armament: up to 5x7.92-mm (0.312-in) mg plus 1500 kg (3,307 lb) bombs.